The DMC-40x0 is available in one through eight-axis formats, and each axis is user-configurable for stepper or servo motor operation. 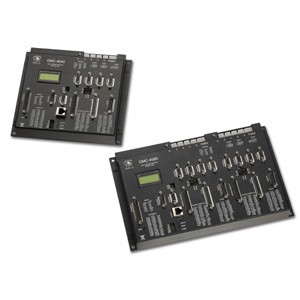 With a powerful RISC processor, the DMC-40x0 controllers provide such advanced features as PID compensation with velocity and acceleration feedforward, program memory with multitasking for simultaneously running eight applications programs, and uncommitted I/O for synchronizing motion with external events. Modes of motion include point-to-point positioning, position tracking, jogging, linear and circular interpolation, contouring, electronic gearing and ecam to name a few. Like all Galil controllers, programming the DMC-40x0 is simplified with two-letter, intuitive commands and a full set of software tools such as GalilTools for servo tuning and analysis. If the DMC-40x0 doesn't completely meet an application's requirements we will cost-effectively modify it so that it does. Modifications include customized firmware and hardware.